Energy stocks, especially some top-shelf high-yield energy stocks, look incredibly attractive right now. Whenever interest rates start to rise, Wall Street tends to panic and sell out of high-yield stocks in favor of bonds. On the surface, that may make for sound economic theory, but there are a lot of things it doesn't consider -- like the management teams of those high-yield stocks making smart decisions that keep those stocks looking attractive over the long term. It's no surprise, then, that many high-yield investments in the energy sector look attractive today. We asked three of our Motley Fool investors to highlight energy stocks they see as compelling buys right now. Unsurprisingly, they picked three high-yield stocks: Enterprise Products Partners (NYSE:EPD), TerraForm Power (NASDAQ:TERP), and Phillips 66 Partners (NYSE:PSXP). Don't write off this energy behemoth as just a "slow-growing stock"
Tyler Crowe (Enterprise Products Partners): It can be easy to dismiss Enterprise Products Partners right now. After the company announced that it was slowing its distribution growth rate to focus on funding its growth prospects, I wouldn't be surprised to hear people say that there are better opportunities elsewhere. Sure, you may not be wowed by distribution growth in the low single digits over the next year or two, but don't overlook how this sets the company up for a better future. To sustain a high-yield investment like Enterprise -- it yields 6% today -- it requires an intense focus on both investing in projects with high rates of return and investing at a pace that doesn't compromise the financials of the company. With more than $5 billion in projects currently in the works varying from much-needed Permian Basin pipelines to expanding the U.S.' energy product export capacity, the company needs a lot of cash over the next couple of years. To avoid diluting current investors by issuing new units, management is instead electing to use its cash-generating abilities to fund a large portion of these projects. By 2020, management wants 50% of all capital spending to be covered by internally generated cash, which will also help improve the company's already-solid debt metrics. What's even better is what might happen once the company completes this massive growth phase. Management has hinted that once capital spending rates return to more normal levels, it will likely increase its distribution growth rate or even buy back stock if the right situation arises. Enterprise has consistently been a good steward of shareholder capital, and management sees this as the best way to stay that way over the next couple of years. With the options it will have after this growth phase, it's hard to not like Enterprise's stock right now. Matt DiLallo (TerraForm Power): Wind and solar power company TerraForm Power recently completed the acquisition of Saeta Yield, which is a Spanish renewable energy company. That transaction is a meaningful one for the company in several ways. Not only will it significantly grow TerraForm's scale and cash flow, but it also firmed up its balance sheet. Those factors position the company to deliver high-powered returns for investors in the coming years. Because TerraForm got such a great deal on Saeta, the company believes it can increase its 7%-yielding dividend by at least a 6% annual rate over the next five years. Several factors should power that growth including the combined companies' ability to reduce costs and reinvest excess cash flow into expansion projects. In addition, TerraForm Power sees the potential to continue making needle-moving acquisitions that expand its renewable energy platform while growing cash flow. TerraForm believes that the company's combination of a 7% yield that it can increase at around a 6% yearly rate has the potential to power a total annual return for investors in the mid-teens over the next several years. That level should be high enough to beat the market, which is what makes TerraForm an excellent energy stock to consider buying right now. Reuben Gregg Brewer (Phillips 66 Partners LP): The rearview mirror is impressive at Phillips 66 Partners, with annualized distribution growth of 31% over the past five years or so. When you add in a yield of roughly 5.3%, the partnership should look attractive to income and dividend growth investors. Also, Phillips 66 Partners' price to enterprise value is roughly a third below that of industry bellwether Enterprise Products Partners LP. Part of the reason for the cheap price is that Phillips 66 Partners is making a big transition. Its historic growth was driven by buying assets from its general partner, refiner Phillips 66. Now, however, it is starting to focus more on internally generated growth driven by ground-up construction and expansions to existing assets. During its first five years, it targeted and achieved 30% annualized distribution growth, but it isn't willing to provide that kind of assurances about future growth despite robust distribution coverage of 1.4 times in the first quarter. PSXP Price to Tangible Book Value data by YCharts. Realistically, it can't match those lofty returns from here. Building from the ground up involves more execution risk and takes longer. And past business expansion means future growth won't be as robust because of the law of large numbers. 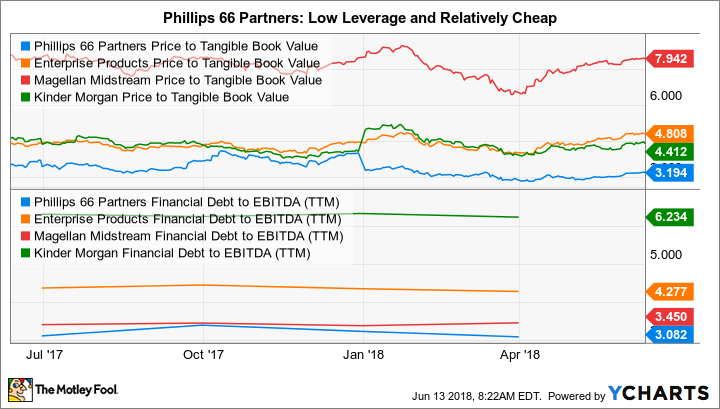 That said, Phillips 66 Partners has a solid balance sheet (debt to EBITDA at 3.1 times is at the low end of the midstream industry), and its general partner appears willing to step in to support growth should construction plans fall short of expectations. The foundation for continued expansion appears strong. 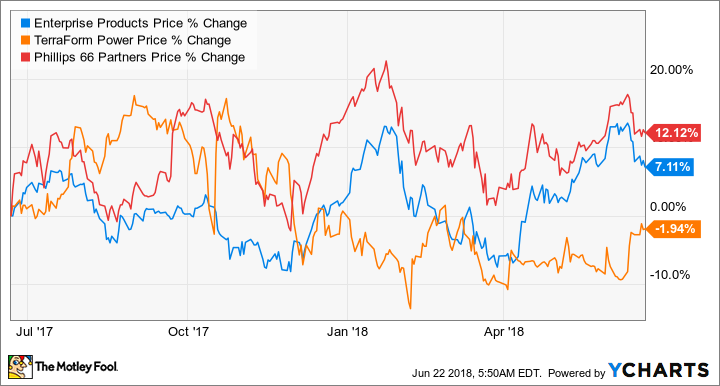 Although there's a clear risk as Phillips 66 Partners shifts to a new stage in its life cycle, the current low price, yield, and growth prospects suggest it's worth a close look right now.